Volunteer drivers use their own cars to take people to appointments where there is no reasonable alternative transport available. Passengers pay a 45p a mile charge to help cover the driver's fuel cost. Please call for further information or to book a journey. The service was established April 2012 as a project of Citizens Advice. M40 Junction 8 or 8a, take the A40 then A420 to Headington Centre and follow signs. M40 junction 9, take the A34 then A40 northern ring road, turning off for Marston (B4150), then B4495 towards Headington and follow signs. Approach from the A4142 Eastern ring road and B4495. For real-time traffic reports visit www.frixo.com. 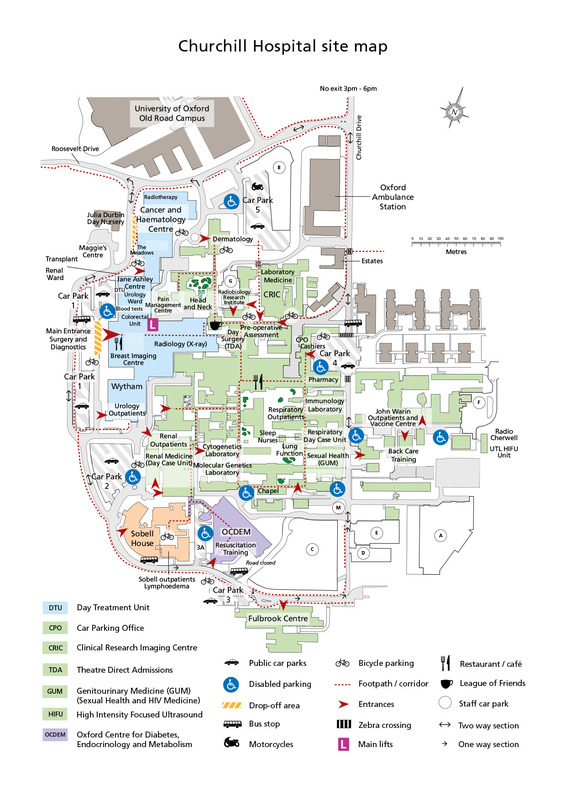 There are patient and visitor car parks at the Churchill Hospital, including directly outside the Oxford Cancer Centre (Car Parks 1 and 2). All patient and visitor car parks are numbered, but staff car parks are prefixed with a letter. Please note: some car parks are 'Pay and Display' whilst others are 'Pay on Foot'. 'Pay on Foot'. This means you take a ticket at the barrier on entry and pay when you are ready to leave, validating your ticket at one of the pay stations, which will then allow you to exit. The first 30 minutes are free in Pay on Foot car parks; this is to enable visitors plenty of time to find a space, or wait for one to become free in busy times. 'Pay and Display'. Car Park 4 still operates this system, where visitors need to purchase a ticket from one of the machines in the vicinity and display it clearly in the vehicle. Under certain circumstances, patients or visitors may be entitled to discounted or free parking. The car parks are run by the Trust and not as a commercial operation. All money raised goes directly back to patient and visitor services. Parking is free overnight if you arrive after 8.00pm and leave before 8.00am. Unfortunately we are unable to accept cards in our payment machines. There is parking for disabled Blue Badge holders. Disabled parking within the Pay on Foot car parks is subject to charge. Free spaces are available around the site including within Car Park 4 but always refer to the signage. There is a £25 penalty for inappropriate parking in disabled spaces (£50 if not paid within 14 days). For more details about car parking on site please contact the Car Parking Office at the old main entrance on Churchill Drive, near Car Park 4. If you need help outside these times please contact Security via the Churchill Hospital switchboard.